Cardiovascular disease (CVD) is the world’s leading cause of death, and up to 90% of CV events are related to our poor lifestyle choices. Adulthood depression nearly doubles the risk for CVD. Depression in adolescence might negatively influence behavioral choices pertaining to food choices, activity levels and exercise, friends and social interaction, school performance and education, outlook and overall attitude towards life. These factors, in turn, can reinforce unhealthy lifestyles. Only now are we beginning to understand the numerous ways through which negative thoughts, stress, and depression contribute to CVD. Recognizing these psychological aspects earlier in childhood can significantly reduce CVD throughout life. Adolescents scoring high on one or more self-reported depressive symptoms might be at risk for development of obesity and hypertension. We analyzed a large national database that conducted a series of scientific surveys and health tests at periodic intervals on a representative sample of US individuals beginning in adolescence through adulthood. Lifestyle data (i.e., behavioral, socio-economic, socio-demographic data) and biological (health) data of these individuals were surveyed every few years. The first survey was administered in 1994–95 when participants were still adolescents in high school. Subsequently, the study followed the participants from adolescence (wave 2 in 1996) to early adulthood (wave 3 in 2001-2002 and wave 4 in 2007-2008) when their average age was 28 years. We aimed to study how self-reported depressive symptoms in childhood correlated with obesity and hypertension in adulthood. Based on the AHA recommendations and data collected by the study, we identified the following depressive symptoms: poor appetite, trouble falling asleep, trouble relaxing, moodiness, frequent crying, missing social activities, feeling depressed, and feeling sad. A subject is categorized as having a symptom if he/she reported experiencing that symptom on most or all days. We did not attempt to diagnose clinical depression retrospectively, as this study was based on self-reported survey questions. To mitigate the effect of confounding variables, we controlled for the following factors: socio-demographic (age, race, and gender), socio-economic, and health status. People with a body mass index (BMI) over 30 kg/m2 are considered obese. Subjects with a systolic pressure of 120 mmHg or above and diastolic pressure of 80 mmHg or above are considered to have high BP. We studied over 14,000 individuals from adolescence through adulthood. Prevalence of obesity defined was 36% (5240 out of 14,436 participants) and 18% were already obese in adolescence. Although the average subject age was only 28 years among the 14,381 study subjects in wave 4, already 9465 (66%) had high BP (≥ 120/80mmHg). Childhood obesity increased the risk for both obesity and high BP in early adulthood. Adolescent moodiness significantly impacts early adulthood obesity. Adolescents who feel sad on most days are at a higher risk for both adulthood obesity and high BP. 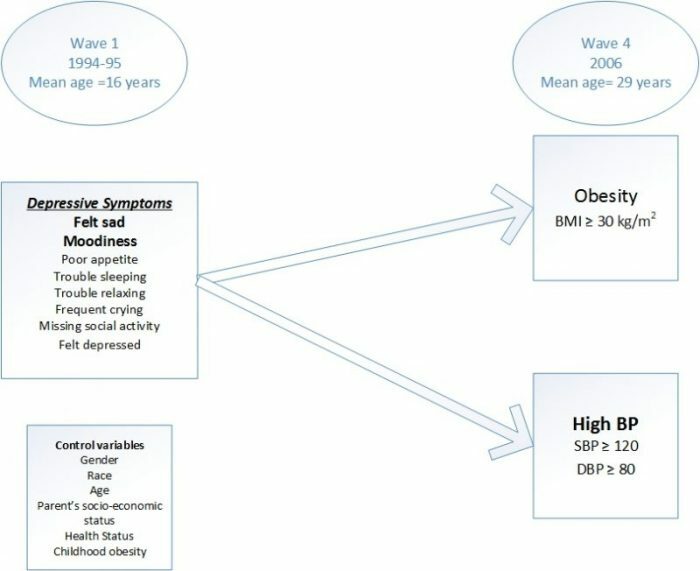 There are not many prospective studies evaluating the risk for future development of high BP, while only a few longitudinal studies that investigate the effect of clinical depression in adolescence leading to subsequent adulthood obesity. In this survey of US individuals, “feeling sad” in adolescence is independently correlated with later development of obesity and high BP in adulthood. Self-reported excessive “moodiness” significantly increases the risk of obesity. Depression is prevalent in about 15% of US adolescents, and this is recognized as a major risk factor for suicide and mortality in this age group. We demonstrated the correlation between specific depressive symptoms and adulthood major CVD risk factors. True adversity, like poor economic status or life events, may account for the moodiness. Excessive moodiness may represent a high level of perceived stress and failure to cope with routine life circumstances. Lastly, this may be a symptom of underlying anxiety or depression. Moodiness correlates with later development of obesity. Depressive symptoms may start early in life and significantly impact health and CVD for several decades. These symptoms may directly increase sympathetic stress hormones. In addition, they may adversely affect dietary choices as well as participation in physical activity and sports. The cumulative effect of these unhealthy lifestyle patterns may accelerate the onset of hypertension, obesity, and CVD. Depressive symptoms in adolescence directly correlate with risk for high BP and obesity in young adults. Optimally addressing depressive symptoms in adolescents may play a vital role in shaping young minds and providing sufficient self-awareness and introspection, allowing them to mature into adults with a resilient mindset and healthier lifestyles. These findings are described in the article entitled Self-reported depressive symptoms in adolescence increase the risk for obesity and high BP in adulthood, recently published in the International Journal of Cardiology. This work was conducted by Sharan Srinivas, Suchithra Rajendran, Kavin Anand, and Anand Chockalingam, MD from the University of Missouri. Anand specializes in cardiovascular medicine at the University of Missouri-Columbia, with research interests including cardiac critical care, echocardiography, cardiac rehabilitation, preventive health, and holistic heart health.